Wear warm shoes. Forget the ultra pointy shoes that constrict blood flow to your feet and wear rounder shoes which will allow you to wear warm socks. Warm feet equals better blood flow to the extremities. Wash your hands often. We let in cold viruses when we touch our faces with dirty hands. Many women do this considerably more than our male counterparts. Make sure your pyjamas and bed socks aren't too tight. Allow blood flow through your body while you sleep in the winter. Don't cut off vital health to your legs or stomach by tight elastic on clothes and socks. When using public toilets, go to the first one. Not many people use those, so winter bugs aren't as stagnant in those. If your heels dry out and crack, regularly rub Vaseline on them before you go to bed. Make sure you keep a special pair of bed socks to wear, as you don't want to spoil your bed sheets. Brush your heels lightly in the morning and repeat treatment at night. Avoid wearing thongs when you have so much clothes on. In the winter we wear tights (stockings) and other layers of clothes over our underwear. There is no where for bacteria to escape to (but up). Give yourself some 'breathing' space and stick with less constricted underwear. Alcohol dries you out. Lessen your alcohol intake in winter and save your face from ageing. Moisturisers are fine, but youth radiates from the inside out. Take heed to what you're consuming. It's more difficult to drink water when it's cold, so set alarms on your phone to remind you to drink water. Buy seasonal fruit or drink smoothies to maintain essential vitamin intake. Fight the colds and flu. Microwave your vegetables instead of boiling them. Eat breakfast. Your body needs the early morning weapon to stave off all that's cooking in the air. 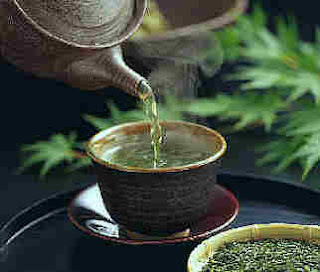 If you must have lots of hot drinks, drink green tea instead of coffee and other beverages. Sit on a fitness ball while watching TV. It helps you to control your balance and body weight, thus assist in building your core muscles. Stand straight and let your shoulders relax. We tend to scrunch up our muscles when we're cold. This only encourages tight and painful shoulders and upper arms. Wear thermals and allow yourself to release the tension you build up without knowing. Take the stairs. It's good for you and it helps the blood flow better in the cold. Great advices, Anne..I drink lots of hot tea, mostly herbs and green tea. Beside green tea, flower tea is also good for health.